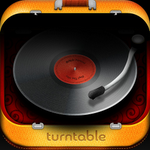 We've been waiting on turntable.fm to land on Android for a while now. Well, it's finally here! 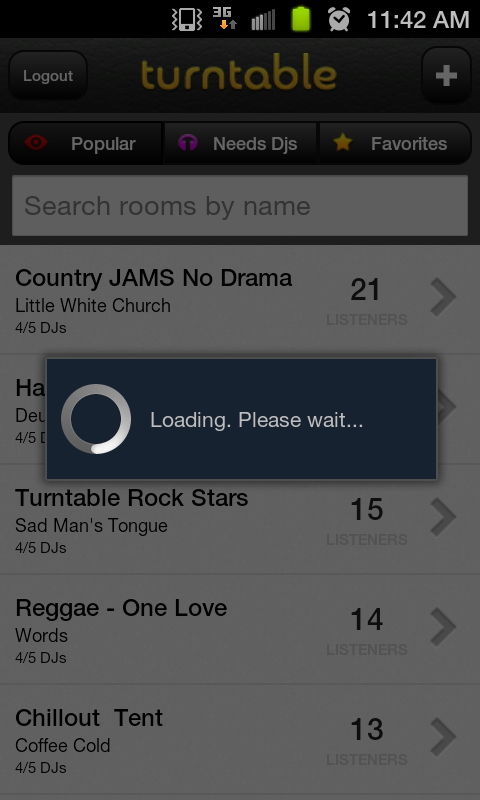 The music sharing service has been available for a little over a year on desktop machines. The concept is simple: DJs join a room and share songs with an audience that can then vote on whether a song is Awesome or Lame. It's a great concept for sharing music. The only thing that could make it better is if you could listen to (or DJ!) a room while away from your computer. iOS users have been able to do this for a couple months, and now Android users can join the fray. The app, from a bird's-eye-view looks very much like its iOS counterpart (more on that in a bit), but more importantly, almost identical to its desktop version, which makes the entire experience rather seamless. Let's get this out of the way right off the bat: yes, it looks a bit like the iOS version. In that, in the DJ room, you can see one button that is the same style as an iOS share button. 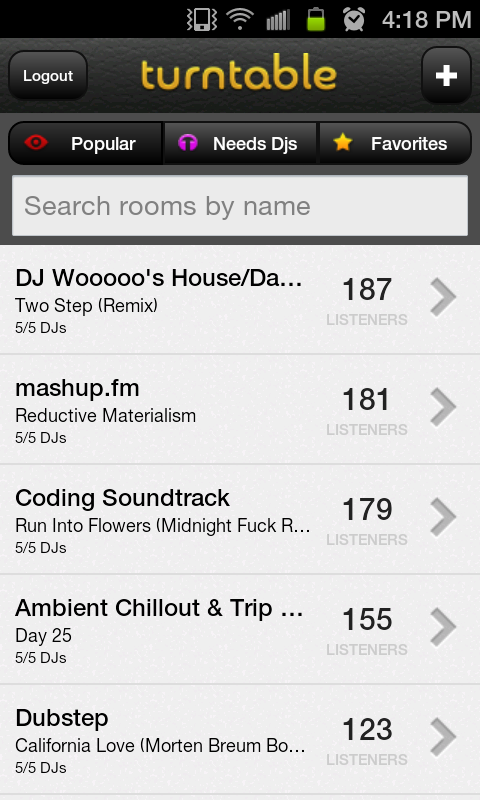 Little things like that will pop up throughout the app, mostly on the room selection screen (above center). However, for the most part, the app doesn't rip off its iOS version so much as it does, well...itself. 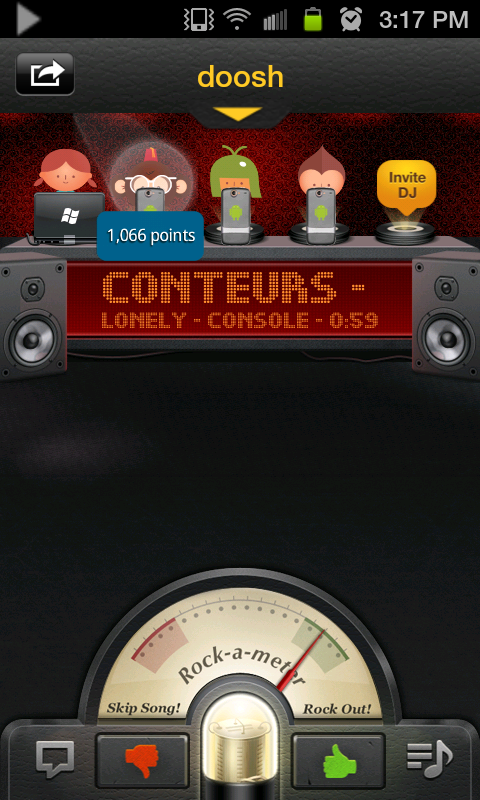 Part of turntable.fm's appeal is its gorgeous UI. All the main elements of the interface we know and love from the desktop are here. 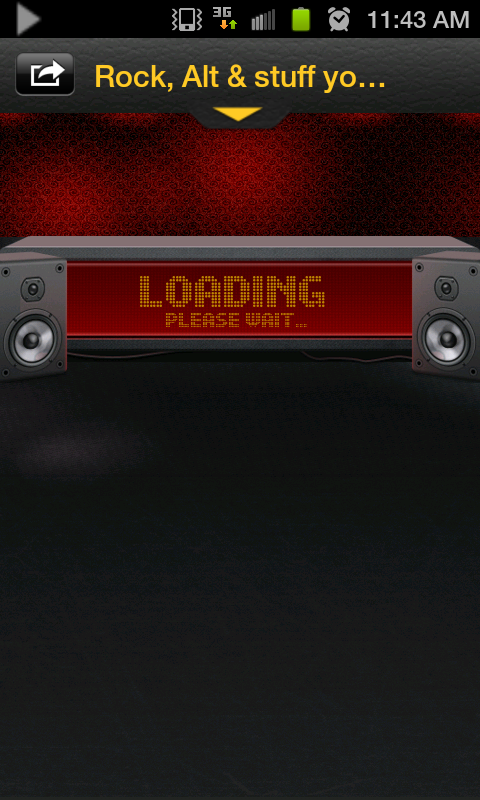 The rock meter, the Awesome/Lame buttons, bopping heads, dance floor, DJ spotlights, everything. This wasn't cut-and-pasted from an iOS app. This design was lovingly recreated in a beautiful high-resolution app from its desktop counterpart. 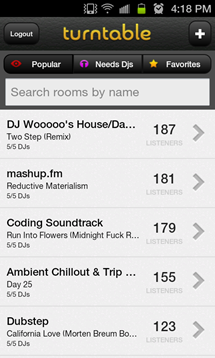 Compare to some other obviously iOS-inspired apps, and the difference is pretty staggering. In general, I will be the first to say that using an iOS scheme is confusing, lazy design. It mixes Android and iOS navigation elements and generally doesn't look good. 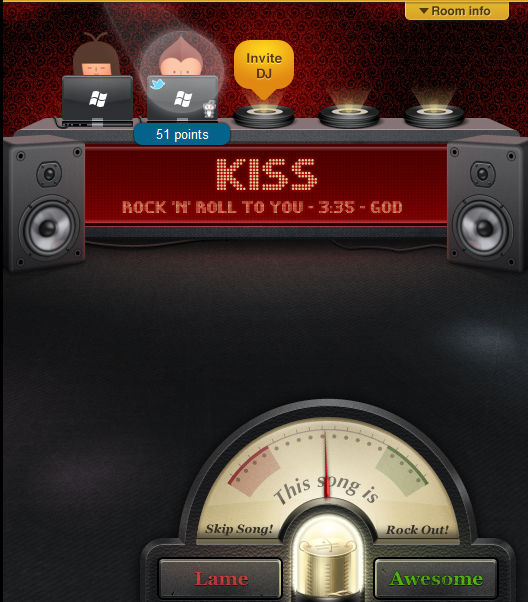 However, in this instance, not only did the folks behind turntable.fm at least take the effort to use high-resolution assets in the iOS elements they did use, but they very rarely used those elements to begin with. 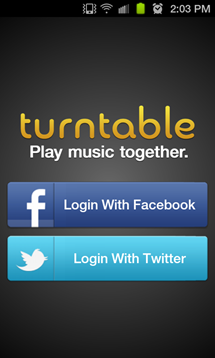 Most of the interface is still built specifically by turntable, based on turntable, for turntable. Not only that, but those lovely head-bopping animations, as well as many other trademark turntable accents, are beautifully fluid. I would like to reiterate this clearly for those of you who insist that a single iOS button means an app is ugly: This app is the single most gorgeous app I've used on Android ever. If you think this app is ugly, you either think turntable.fm itself is ugly or you're getting hung up on 10% of the app design. Most of the time you use the app, you'll barely even notice it. Of course, nice things to look at don't mean much if you can't actually listen to music. The biggest hang up with this app will be largely determined by how good your network is. I tested this app on an Epic 4G Touch on Sprint. Needless to say, this worked...sometimes. Sprint isn't known for having the best coverage, and I had some serious problems while switching between WiMax and 3G. 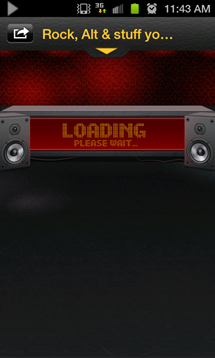 The app got hung up when I turned WiMax off completely and it needed a force stop to break out of a loop that wouldn't even load room names. Now, it's hard to fault turntable.fm too much for this. Sprint phones in general don't have the best reception and I have trouble switching between 4G and 3G outside of this app. Turntable.fm requires a lot of simultaneous connections so the fact that it's working at all is a testament to the power of the brave new wireless internet world. That being said, my LTE-using friends gave this app a whirl and found the same problem, if less often. Both AT&T and Verizon LTE users had less trouble than I did, but none were immune to the occasional disconnect. In short, if you don't have a decent network, you'll have trouble with this app. You may be able to get a good experience even on 3G, but only if you have a consistent connection. If you're switching constantly between 3G and 4G, or if you have scattered reception, you'll face some serious problems. 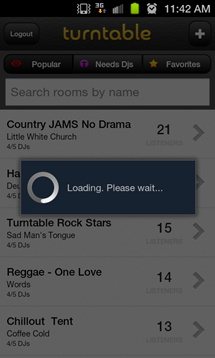 As soon as your connection drops, the app will likely boot you from the room, as well as your DJ spot if you have one. In some cases you may be booted from the room, but not realize it until a song is done playing. This app has a little ways to go in the stability department. On the day of release, two updates were already released, so the company is probably working on it, but a large part of the problems turntable has and will continue to have are largely dependent on network infrastructure. Unfortunately, the two carriers with the largest LTE networks are also the carriers with data caps. While it's fantastic to have the option, and I, for one, have used it multiple times throughout the weekend, it may still be a while before you're able to use it without the occasional hiccup or disconnect. 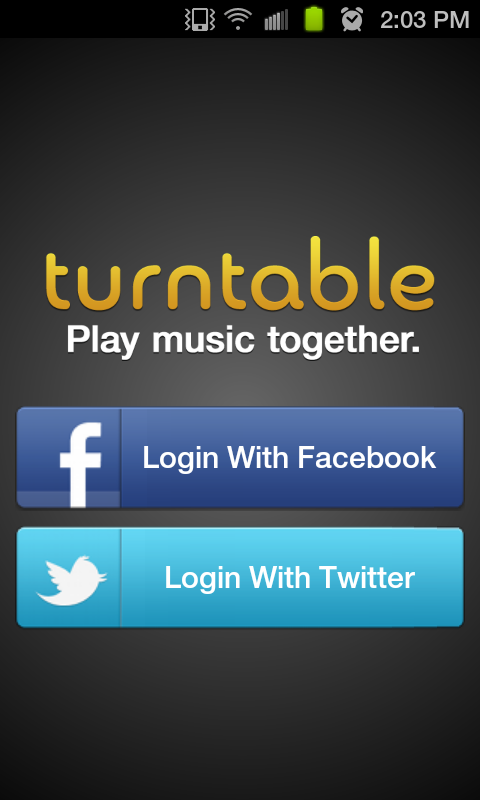 If that's something you can live with, though, turntable is a product worth checking out.